The gradebook can be turned off for the cases where some teachers in the school will not be using the School Loop Gradebook. A typical scenario would be a K-8 school, where only the middle school teachers will use the School Loop gradebook. In this case the elementary teachers can turn off the gradebook themselves, or a Sys Admin can do it for them. 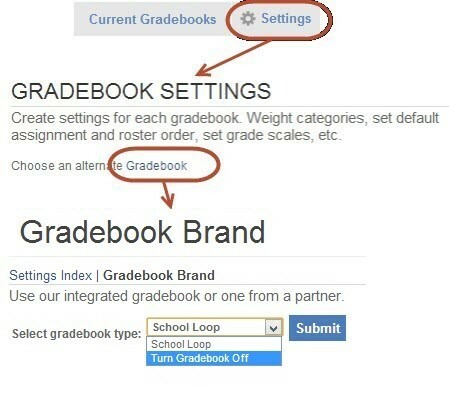 Click the Settings link located in the main navigation bar, then the "Choose an alternate Gradebook" link on the right side under Gradebook Settings, and finally select Turn Gradebook Off from the pull down menu and click Submit. All traces of our gradebook will be hidden, but the teacher will still be able to see their rosters, add assignments to the calendar and communicate with their students and their parents.